When I'm typing fast, it's easy to make spelling mistakes (as you may have noticed reading Emacs-Fu). It's not so much that I don't know how to write things, but sometimes there seems to be a bit of a disconnect between brain and fingers. One tool that helps me to make fewer mistakes is automatic spelling checking, and in particular on-the-fly spelling checking. Spell-checking in emacs is taken care of by the ispell-package. Traditionally, this was a way to interface emacs with the ispell-program on Unix, but nowadays it's often used with other programs, such as aspell. Please consult the aspell documentation for the details. You can spell-check your text with ispell-buffer and friends, which are also available through the menu (Tools/Spell Checking/...). This works fine, but it makes spelling checking a separate step you have to go through and you may forget. So, I like to do the spelling-checking on-the-fly, that is, while I am typing. This can be done using flyspell-mode (you can also use flyspell-prog-mode, to do spell checking inside comments in computer programs, but I find that a bit over the top). Note, you can use the middle mouse button to get alternatives for a misspelled word. By default, it uses the English dictionary, but it's easy to switch to another using M-x ispell-change-dictionary. To make it easier, I have defined the C-c N key binding to activate Dutch-language ("nederlands") spelling checking, and update the buffer. Now, there's another category of mistakes – their-they're-there, its-it's or to-too-two that require a spelling checker that's a bit smarter. There are some free implementations in OpenOffice and Abiword; it'd be interesting to see if those could be integrated with emacs as well. Scrolling It's an integral part of just about any graphical user interface, including emacs. However, I always found that the default way scrolling works in emacs left something to be desired. It puts the scroll bar on the left (! ), and when scrolling around, it does not scroll smoothly, but instead it seem to do so in bursts. But, this being emacs, we can change it! Instead of right, you can also use left, or nil to hide the scroll bar completely. You can also do this through the menu (Options / Show/Hide / Scroll bar). Note that on X, when the cursor (point) reaches the end of the document, the slider on the scroll bar may not be at the bottom; I understand this is because of some disagreement between Emacs and the toolkit (GTK+ in this case). Now, what about the other issue, the non-smoothness when scrolling with the cursor-keys or with C-n, C-p? Below are my settings for making scrolling a bit smoother, and the explanation. Of course, these are just my personal preferences. scroll-preserve-screen-position tries to maintain the current screen position when you scroll using Page-Up/Page-Down. I like that. There are also the variables scroll-up-aggressively and scroll-down-aggressively. Normally, they determine how far emacs will scroll (up and down, respectively) when it does so. However, they don't make any difference with a big scroll-conservatively like I am using. Still, if you want to play with it, their values are fractions between 0.0 and 1.0 (inclusive); a value of 1 means that it will move a full screen when scrolling starts, a value of 0.0 causes a move of only one single line. When typing some text, it's often useful to know what mode we're in – are we in overwrite-mode, in read-only-mode, or in normal insert-mode. The information is available in the mode-line – but wouldn't it be nicer to get some small visual cue, for example by changing the cursor color or style? That indeed is possible. There are some existing ways to do this, described in EmacsWiki. However, I want to be able to control both the cursor color and cursor shape, and also distinguish between overwrite, read-only and 'normal' mode. Below is my attempt. By putting the following snippet in your .emacs, the cursor becomes a yellow vertical bar during normal mode, it becomes a red block when you're in overwrite-mode and it becomes a gray vertical bar when you're in read-only mode. "change cursor color and type according to some minor modes." You can change the colors and cursor types by modifying the various variables. I should probably turn this into a proper minor mode, but for now this seems to work well. When you open a file in emacs, the buffer gets the name of that file. That's all fine, but what if you open multiple files with the same name? At least for me, it's a fairly common to have a number of different Makefile.am buffers Makefile.am<3> etc., but that does really help to find the right one at the same time. Emacs does make those names unique – Makefile.am<2>, quickly. This is emacs, so you can influence the way in which the names are made unique. I prefer post-forward, and as separator I use a : rather than the default |. Note, instead of post-forward there are other bizarre styles, please see the documentation. Anyway, now, when opening ('visiting') files test/a/foo and test/b/foo, their buffers get the names foo:a and foo:b. In other words, the name followed by a colon and part of the path. I think it's much clearer than the default names foo and foo<2>. One could ask why emacs should not use uniquify as its default behavior; it seems a clear improvement. Uniquify is a small convenience that's been a documented part of emacs for 20 years. Still, somehow I missed it until this year. I suspect I am not the only one - which is why I write this. Updated: yes, it's %s, not %d Sometimes, it's nice when emacs can warn you when something is happening or should happen. For example, when a new e-mail has arrived, or when there's a meeting in 15 minutes you should attend. As always, there are different way to do this, but here's what I've been using for while. Various versions of this have been circulating around mailing lists, so I don't know whom to credit with the original idea – anyway, this is the (modified) version that I'm using. a sound to be played"
I'm using notify-send for sending notifications; this assumes you are using that system (it's part of the libnotify-bin package in Debian/Ubuntu). You can of course replace it with whatever is available on your system. Alternatives are zenity or kdialog or xmessage (for old-timers) and their equivalents (?) on Windows, MacOS. Now, we can use this function by evaluation e.g. (djcb-popup "Warning" "The end is near"
Of course, you can freely choose a icon / sound to your liking. (djcb-popup "Wanderlust" "You have new mail!" Exercise for the reader: adapt this for your chosen mail client. When I'm programming, I often need to copy a line. Normally, this requires me to first select ('mark') the line I want to copy. That does not seem like a big deal, but when I'm in the 'flow' I want to avoid any little obstacle that can slow me down. So, how can I copy the current line without selection? I found a nice trick by MacChan on EmacsWiki to accomplish this. It also adds ta function to kill (cut) the current line (similar to kill-line (C-k), but kills the whole line, not just from point (cursor) to the end. The code below simply embellishes the normal functions with the functionality 'if nothing is selected, assume we mean the current line'. The key bindings stay the same (M-w, C-w). interactively with no active region, copy a single line instead." "When called interactively with no active region, kill a single line instead." It also shows the power of Emacs-Lisp with the defadvice-macro – see the fine documentation. Using defadvice, you can 'decorate' any function with your own modifications. This great power should be used with caution, of course, as to not break other usage that assumes the undecorated versions. In this case, that seem unlikely. And note that the 'advise' only applies when the functions are called interactively. Bookmarks are especially handy if you have long file names, or for examples the special file names for editing root-owned files discussed here before. To start using bookmarks effectively, there are only a few important key bindings to memorize: C-x r m ('make') will create a new bookmark, defaulting to the current file. Then, you can jump to an existing bookmark with C-x r b ('bookmark') Finally, you can see the list of your bookmarks with C-x r l ('list'). Earlier, I spoke of the wonderful Wanderlust e-mail client. After years of using mutt, I am a quite happy Wanderlust-user now. Now, it's few months since my conversion, time to discuss some of the customizations I did. Not all the defaults are so well-chosen (in my opinion), but fortunately, the package is very configurable. If you are interested in Wanderlust, this entry might save you some time in figuring out such customizations and some other tricks. If you haven't done so before, I'd recommend you to read the older entry first. Also, the entry about BBDB may be useful. Before going into the customizations, let me first answer a question I got asked a couple of times: why I am using Wanderlust and not, say, VM, gnus, Mew or even mutt or some other client? To start with the last part, an emacs-based client fits in very well with my workflow, which is (duh) revolves around emacs. Doing my email there as well makes a lot of sense - a little return-on-investment for the time spent taming emacs and its bag of tricks. The reason I particularly like Wanderlust, is that it works very well with mail stored in maildirs - as you may know, maildir is a one-file-per-message way of storing your mail on disk. That's great for backing up things, and sync'ing different machines. Unlike VM and gnus, Wanderlust keeps the mail in the maildir as-is, and does not use a separate spoolfile – thus, all changes are reflected in the maildir itself, making it possible to use different clients (ie., use mutt when needed). Even more important, the wonderful tool offlineimap does two-way synchronization with IMAP-servers, and downloads everything into a maildir. So, I can download all the mail on my laptop machine, go offline and work on the messages (delete, move, reply etc.) during a flight, and when I'm back online, I can synchronize things. All this 'cloud'-stuff is nice, but I like to have my mails on my side of the intertubes. Ok, now let's take a look at some of the customizations and tricks. All of these are little snippets to add to your ~/.wl-file. I wonder why this is not the default. wl-forward-subject-prefix "Fwd: " )    ;; use "Fwd: " not "Forward: "
By default, Wanderlust uses Reply-to-All; that is usually not what we (well, I) want. The code below makes Reply-to-Sender the default, with Reply-to-All behind C-u; ie. A or a will reply to sender, C-u A and C-u a reply to all. ;; Invert behaviour of with and without argument replies. Note, there are some hooks for other spamfiltering solutions as well. ("Subject" ;; put more specific rules before more general ones. Semi-automatic refiling works fairly well, but you might also want to have some explicit shortcuts to move messages to specific folders. For example, to move message from your inbox to your Project X-folder, or your Project Y-folder. "refile the current message to FOLDER; if FOLDER is nil, use the default"
Assuming you have (Maildir) folders project-x and project-y. It's not uncommon to forget to add a subject or an attachment when you send a mail (or at least, when I send a mail…). However, using wl-mail-send-pre-hook we can let Wanderlust warn us when something like that happens. "check whether the message has a subject before sending"
"if attachment is mention but none included, warn the the user"
(unless ;; don't we have an attachment? (when ;; no attachment; did we mention an attachment? Ok, that's all for now… I'll get back to Wanderlust in the future; of course, feel free to add your own tricks in the comments-section. Earlier this year, Chong Yidong and Stefan Monnier took over Emacs maintainership from Richard Stallman, and they successfully completed the Emacs 23.1 release. I asked them a couple of questions about the process, Emacs-development and some of the plans for the future. I'd like to thank Chong (CYD) and Stefan (SM) to take the time to answer my (djcb) questions and even more so for doing an excellent job bringing us Emacs 23! djcb: First of all, could you tell us a bit about yourself? For example, what you do when not hacking on Emacs? CYD: I'm a postdoc in theoretical physics, specializing in photonic crystals and other optical phenomena. SM: I'm a professor at the University of Montréal, teaching and researching theory of computer languages. More specifically, I design new type systems and try and abuse existing type systems for "type based formal methods" purposes. djcb: Earlier this year, the two of you took over the maintainership of Emacs from Richard Stallman. How did you get involved in hacking on Emacs? How has the transition gone? CYD: My first involvement in Emacs-related development was around 2004 or 2005—very recent by Emacs hacker standards—when I found myself with some free time on my hands after college. At that time, I wrote wikipedia-mode, a major mode for editing Wikipedia articles, plus some word-wrapping code that eventually became longlines-mode, and patches to emacs-devel fixing a few minor bugs. My level of involvement gradually grew, until eventually I was helping Richard to roll the pretest tarballs for the Emacs 22 release. Because I was quite active in the Emacs 22 release process, I've been pretty comfortable with my role in Emacs 23. It helps, of course, that many parts of Emacs have their own dedicated and experienced maintainers, e.g. the major Lisp packages such as CC-mode, Gnus, and Org-mode. SM: I started hacking on Emacs a fairly long time ago when I was waiting to start my PhD, but it only got more serious during my PhD when I decided that PCL-CVS was a neat idea but unusable as it stood (for lack of maintainership). It all went downhill from there. The transition to maintainership happened very smoothly. I had already considered maintaining Emacs when Gerd [ Gerd Moellmann ] left (i.e. when 21.1 was released; at which point Richard ended up regaining maintainership for lack of any other volunteer), but it was a pretty busy time for me, so I decided not to. This time Richard kept a very active role, which coupled with the help of Chong made it very pleasant. There's a fair bit of pressure, of course, because it's a very old package, so people have a lot invested in it, making some changes terribly delicate. As a maintainer, I did get to steer the direction of Emacs development, tho mostly by my own contributions and by imposing some contentious new defaults. The role of a maintainer as I see it is mostly to make sure the package keeps its integrity. But I have to say, that while Chong started maybe a bit more of a "rookie maintainer" than I, he quickly took over and he deserves much of the credit for 23.1, while I was too busy with my work to do much good. djcb: Talking about Emacs development: there are of course many people involved. Can you give a estimate of how many? CYD: There are about 120 people who have commit access to the code repository; of these, I think around 20 contribute regularly. This does not count the packages that are maintained separately from Emacs. Additionally, we do of course receive a steady stream of small patches from various users. Emacs 23 has just been released (on July 29 2009), congratulations, a great accomplishment indeed! From your perspective, what are the most important improvements in Emacs 23 for end-users? And what about the internals? Are there any big changes in the way Emacs operates? CYD: I'd describe the Emacs 23 release cycle as dominated by internals changes, in contrast with Emacs 22, where most of the major improvements occurred at the Lisp level. There are two fundamental changes. First, the internal character representation is now Unicode-based, which simplifies various aspects of multilingual editing. Second, the font engine has been revamped, and, among other things, we now support anti-aliasing on X. Both these changes are due largely to Kenichi Handa, who deserves a huge amount of credit for patiently developing the code a period of years. One other major internals change is a restructuring of the terminal interaction code, by Károly Lőrentey, which allows a single Emacs process to display on X and text terminals simultaneously. Building on this "multi-tty" code, Dan Nicolescu implemented a small but clever hack, allowing Emacs to run as a daemon serving emacsclient connections. There are several Lisp-level changes, large and small. For instance, Stefan revamped the minibuffer completion code, which is now more sophisticated about generating completions. And there are, as usual, new modes and packages: Doc-view mode, Ruby mode, nXml mode, etc. SM: Better support for Unicode, and better support for fonts, multi-tty support, plus lots of new modes as always. Of course, I'm very happy with my new completion code, which makes partial-completion-mode obsolete (and enabled by default). The new support for Unicode and for fonts required significant changes. Big thanks to Kenichi Handa for most of that. djcb: Are there any features that you would have liked to add, but that were somehow not yet ready? CYD: One feature that I'd have liked to include into 23.1 is CEDET, a set of packages by Eric Ludlum (the author of Speedbar), which turns Emacs into an IDE. There was no time to merge it for 23.1, but hopefully it will be included in 23.2. SM: Several packages were planned for inclusion, but didn't make it. Support for GNUstep was planned (and is actually in there) but doesn't work. Also I hoped the new VC code would be developed further, but it sadly stayed at the stage where it mostly provides the same features as the old one (with all kinds of improvements in the way it supports them, tho). djcb: There is always a bit of tension in Emacs between keeping things as they are, and changing things to be more like other programs - for example when thinking about key bindings and various defaults. What is your take on this? Should Emacs try to accommodate new users, or instead try to keep things as they are? CYD: My impression is that I'm a little more conservative than Stefan with regards to changes, though I'm not sure what he thinks ;-) That said, we seem to arrive at the same conclusions with surprising frequency. SM: Emacs standard key bindings (like C-x and C-c prefixes) clash badly with "standard" key bindings of other apps, so I don't think there's much hope to make Emacs like other applications. But yes, I generally believe that, all things being equal, it's better to be like others than to be different in this respect. But since changing bindings (or behaviors) is disruptive, I only consider it worthwhile if I believe the new default is really superior (not just for new users). djcb: For example, in Emacs 23, transient-mark-mode is the default, but delete-selection-mode is not. How do you decide such things? CYD: Typically, we try not to make flashy changes. The transient mark mode change is the exception that proves the rule: transient-mark-mode is so useful, and is so widely used (even Richard uses it), that it doesn't make sense to leave it off by default. But the rule of thumb is to improve Emacs on Emacs' own terms; for instance, CUA mode will not become the default anytime soon, I think. SM: transient-mark-mode is an enabler: it allows some commands to behave differently depending on the activation state of the region. So it's a clear improvement. delete-selection-mode is not as important in this regard. We may see something along the lines of delete-selection-mode at some point, tho probably something more minor that only caters to the few cases where delete-selection-mode is more than just a way to avoid hitting C-w.
djcb: How do you see the competition with other text editors? Do you look for ideas elsewhere? Is there any other editor you would be using if Emacs did not exist? CYD: I'm afraid I don't pay much attention to other editors. SM: I used Zmacs, XEmacs, and Epoch at some point. That's about it. I do like structured editors, and I think Emacs should and will move in this direction (with more parsing going on). djcb: It's a bit premature of course, but it's always interesting to speculate a bit about the future. Do you have any particular post-Emacs-23 plans? Obviously, this all depends on what people come up with, but are there any directions you would like Emacs to go? CYD: The present plan is for Emacs 23.2 to contain a small number of new features, in addition to bugfixes. As mentioned above, I'd like to try to include CEDET. In general, I hope to move to shorter, more disciplined release cycles. Emacs 23 was a good step in that direction, as it was shorter than the previous cycle. SM: My main goal for Emacs-23 was to shorten the release cycle. Hopefully, the quality has not been reduced accordingly. For 23.N there are several improvements planned (or even done), mostly about inclusion of packages like js2-mode and CEDET. In the longer term, the main goals for me are the integration of the lexical-scoped branch, the support for bidirectional display, and adding more parsing technology (basically replace syntax-tables with something like lex & yacc, maybe). Thanks a lot Stefan and Chong! emacs 23 has been released! Emacs 23(.1) has been released! 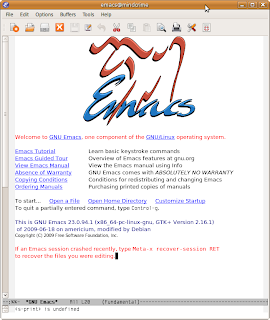 After only just over two years since the previous version, emacs 23 has been released on July 29 2009. Time to celebrate! And a big thanks all the talented hackers that made it possible! 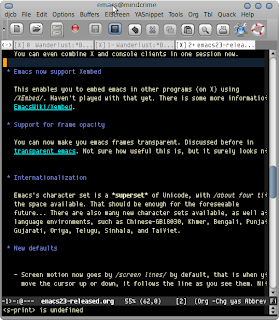 Emacs 23 brings many new features. Some of those have been discussed before in emacs-fu, and of course you can get the full list from the NEWS-file (C-h n). This is just a list of some of the highlights, in particular the end-user-visible ones. Let's go through them - of course I cannot mention all of them, so feel free to add your favorite one in the comments. Finally, emacs 23 brings support for anti-aliased fonts to X (Mac/Windows users have had this for a while). If you're running emacs on X, this one change is enough to never want to go back to an older version of Emacs again. The new font system mentioned in some posts before: setting fonts and emacs 23. You can now call other services on the desktop using the DBUS IPC system (popular on X); using d-bus: an example shows how to communicate with the Tomboy note taker program from emacs. As more and more desktop services are accessible using D-BUS, this offers great opportunities for better integrating emacs with the rest of the desktop. For example, one could imagine that emacs could communicate with a network manager when it needs a connection. Or it could show a desktop notification when an appointment is near. And all without adding hard dependencies or calling external binaries. to insert a list of the available printers in your current buffer. As with D-Bus, it's really an enabler for a lot of cool things. If you have a lot of support packages, emacs startup can be a bit slow. However, emacs 23 brings emacs --daemon, which enables you to start emacs in the background (for example when you log in). You can instantly pop up new emacs windows (frames) with emacsclient. Of course, you could already have an emacs 'server' in older versions, but being able to start it in the background makes this a much nicer solution. The Emacs-daemon was discussed in emacs-fu in emacs –daemon and windows and daemons (for MS-Windows). Popping up new emacs windows is so fast that you can use emacs for any editing job, for example as an editor for an email program, or for quick rememember notes. You can even combine X and console clients in one session now. This enables you to embed emacs in other programs (on X) using XEmbed. Haven't played with that yet. There is some more information in EmacsWiki/Xembed. Emacs's character set is a superset of Unicode, with about four times the space available. That should be enough for the foreseeable future… There are also many new character sets available, as well as new language environments, such as Chinese-GB18030, Khmer, Bengali, Punjabi, Gujarati, Oriya, Telugu, Sinhala, and TaiViet. Note that, internally, emacs uses UTF-8 now. Screen motion now goes by screen lines by default, that is when you move the cursor up or down, it follows the line as you see them. Nice. Transient mark mode (visible selection) is now on by default, so no need for (transient-mark-mode t) in your .emacs anymore. However, you still need to put (delete-selection-mode t) if you like replace the current selection with your typing. Also shift-select mode is enabled by default, so you can select with shift + the arrow keys. file deletion can use the system 'Trash'; see using the system's trash when deleting files. As a small addendum to the entry about keeping related buffers together (with Elscreen): there is also winner-mode, as was mentioned by ustunozgur. winner-mode is a bit simpler than Elscreen. It allows you to step through the various window configuration you had before - instead of having separate 'tabs' as in elscreen, you just step through your history. As you see, I am using the windows-key in the key bindings once more, but of course you can use something else as well. I wrote about switching buffers a couple of times. Switching buffers is one of the things I do a lot when using emacs – switching between e-mail, IRC and some blog entry. Or simply between a couple of source files in a project. With some of the tricks mentioned, switching buffers can be made pretty easy. However, what about programs that consist of multiple buffers? For example, my e-mail program (Wanderlust) splits the screen in separate buffers with mail headers, mail folders and the contents of one message. The same for fancy debugging with gdb, or simply when I have split my screen in two (C-x 2) to view two files at the same time. When I then try to switch buffers, only one of the related buffers will be switched – which is usually not what I want. I'd like to treat a set of related buffers plus their screen layout as a logical unit. There are different ways to do that in emacs. One obvious way is to use multiple frames (windows). But I prefer to keep everything in one - and I found the that the easiest solution is elscreen. Now, whenever I want to switch to a new task, say, read e-mail, I press F9, and a new elscreen will appear (it's visible as a sort-of 'tab' at the top of your screen), and start e-mail there. I can then switch to other elscreens, and all of them maintain their buffers and window layout. I have found this very useful. There are some more tricks, and some add-on packages, but this should give you a good start. There is one small item on my todo-list. Example: when I push M-x wl, emacs automatically switches to the Wanderlust-buffer – or starts it. Now, when using elscreen, I'd like to automatically switch to the correct screen instead of switching the current buffer. Emacs has many useful functions, but for the most efficient use you really need to make keybindings (as previously discussed) for the ones you use often. There's no shortage of possible shortcuts, but the number of easy-to-remember bindings is fairly limited. I can remember bindings that I use all the time like M-w for copy (well, kill-ring-save), or M-q (fill-paragraph) to word-wrap a paragraph, even if they're not that mnemonic (interestingly, it can be hard to verbalize these bindings when someone ask me – but my fingers have no such trouble). super + arrow keys I now use for windmove (see here). The windows-keys are not perfect of course – they don't work from the console (easily) or, ironically, on Windows. But they are mnemonic – I can remember s-t for twitter; contrast this with C-x 5 2 to create a new frame. So, I wonder, does anyone have some clever scheme for their key bindings? I think I am getting much of the efficiency from emacs from the fact that I can do just about anything with some quick actions on the keyboard, so I'm very interested. With the pop-global-mark-command, you can quickly jump back to the locations you were before, like tracking back your bread crumbs. A typical example of this is when doing some programming and looking up some function in another file, which refers to a function in yet another file, and so on – for example, see navigating through source code using tags. Press C-x C-SPC (the default key binding for pop-global-mark) to make your journey back to where you came from; it works in a cyclical fashion as well, so you can go on and on. NOTE: if you like Org-Mode, please go and vote for it in SourceForge Community Choice Award – it's in the Most Likely to Change Change the Way You Do Everything-category. For pleasant working with emacs, one of the more important things is choosing the right font ('face'). Especially within a windowing system, and especially with Emacs 23, there are a lot of possibilities. I am thinking from the Linux/X-Window perspective here – the support for anti-aliased fonts makes things look so much nicer – as discussed before. On X, there are different ways to set your font. One way is through the menu (Options/Set default font.../). We can also set it in our .emacs, with (set-default-font "<font>"), or using ~/.Xdefaults. The latter method makes emacs-startup quite a bit faster, but this may have become less important in the age of emacs –daemon (Emacs 23). For details, see the FontConfig user manual. Note that installing fonts under X is rather easy as well these days; in most cases all you need to do is put the .ttf-files in your ~/.fonts directory and all will be find, although some program might require a restart. and don't forget to run xrdb ~/.Xdefaults afterwards, to tell X about the changes. All of this should happen before you start emacs. This will set a different default font, based on whether you are running on Windows or X. You can freely adapt it to your own desires of course. Side note: if there is yellow in the code snippet above, that is because of hightlighting lines that are too long. support the characters I might use (incl. accented characters and some greek ones). Following these rules, I found the Envy Code R font to work very nicely. It's not fully Free though: Free to use but distribution prohibited. Raph Levien's Inconsolata is nice as well and truly Free; it does not provide an italic font though (at least it does not show in Emacs). Here's a list of programming fonts. Hmmm… I wanted to write some small entry… And there is so much more to say about fonts. As often, EmacsWiki has a lot of information; for example about FontSets, which allow you to use a sort-of combination-font, which is nice if you have to work with mixed character sets (Latin, Arabic, CJK etc.). Also, the emacs-fu entry on zooming in/out is useful in this context, even though Emacs 23 has gained something similar by default. Also, the entry on color theming may be interesting, in this entry we only look at the default font, but you can change fonts governing only part of emacs as well; see M-x list-faces-display. Or get information about the font at point with C-u C-x =.